wargaming in 28 mm and sometimes smaller: Longstreet Campaign: A Rebel Victory! Myself and Adam had the final game in our American Civil War campaign last night at the Hobby Bunker. It was by far the longest game we had (going almost 4 hours), probably because of the difficulty of the scenario. Adam has been rolling for the scenarios and he rolled a 10, the River Crossing. This is a scenario we had not played before and looked like a difficult one for the attacker. Neither of us had an advantage in the dice roll for initial position so we decided, after some debate, to go with it. Of course, I lost the toss and ended up taking the attacker's role. Essentially we have a wide river that only can be crossed at 4 different fords. The defender sets up first after the additional 8 pieces of terrain have been laid. The attacker gets to place one additional ford as well as the two objectives. I placed the last ford to the bottom right and the two objectives as far apart as I could, I also broadened one ford (they were all 3 BW's wide) to 4 BW's. I think Adam kept on thinking that I had a specific strategy, but really it was pretty simple........to get Epic Points by engaging in combat. I had a significant advantage in both troops numbers and some advantage in quality. I think in retrospect, I should have placed the broader ford to the right of the one I chose or to the central ford. I also should probably have placed the far right objective a little more west and north. I really wanted to split Adam's forces so he could not concentrate in one place, forcing him to hold some of his troops to the centre in reserve which he did. I did not really appreciate before the game that if Adam got entrenched on the far side of the ford, how difficult it would be to cross the ford or dislodge his troops. The center of the battle from the confederate POV, those cannon were a big problem. Far west of the battle with it's well protected objective. I think the battle played out in a fairly historical sense. Artillery fire comprised the first third of the game, I believe we both placed our artillery batteries well and there was a lot of counter battery fire, with which I was generally successful. I believe by the end of the game Adam had lost 6 of his 9 cannon, while I had lost only one. Unfortunately, his cannon did cause significant infantry and cavalry loses before I was able to eliminate them from the game. I suppose I could have held back my infantry attack until my cannon had done their work, but that would have lengthened an already long game and have been pretty boring. Really I probably should have just raced to the fords in the hope of arriving before the rebels and hopefully not too badly mauled. 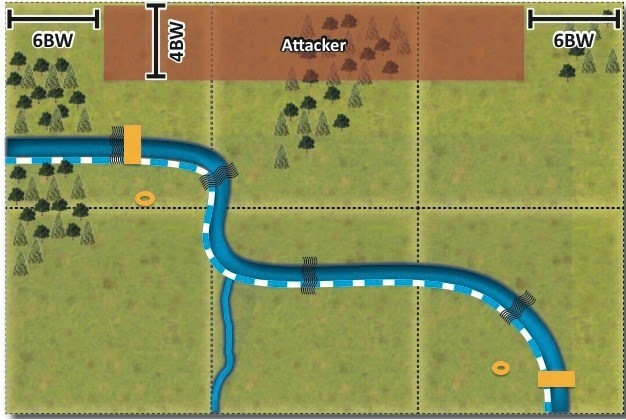 I was able to eventually advance my troops to position where they were able to get in position and cross over the river, I think I did get three infantry units over ultimately. It was very difficult though as Adam had by then entrenched so all my infantry fire was skirmish (hit on 6's only) and all attacker melee was hit on 5 or 6 as I was fighting against troops in cover from difficult terrain. The Union troops also had to suffer canister fire from the remaining Rebel cannon, before they could engage the Rebel infantry. By now I had lost 18 stands to Adams's 12 with a breakpoint of 22, fortunately Adam lost the first morale test so I got to have another turn. Knowing it would be most likely my last, I threw the remaining troops of the 5th NY, the 7th Wisconsin and the 54th Massachusetts against the rebel troops in an attempt to gain an Epic Point (I had 15 bases, so one EP). All were in poor combat position but both the 54th and the 5th had an even chance of winning their combats. And lo and behold, Adam plays the Old Rivals card on the 54th...........immediately halting their attack! There was really not much to do then but withdraw and concede the game to Adam. Well played. Victory to the Rebels by 1 Epic Point. You can see Adam's AR on his blog the Fencing Frog. This was my first campaign and it was enormous fun. I really have to thank Adam as he lugged all the terrain to the Hobby Bunker for each game and lent me a Union army until I got my own troops in place. Longstreet is a great game and I felt the campaign system was very well designed. We are hoping to get a multi player campaign started. Well what is next for Thursday game night at the Hobby Bunker? Well myself and Adam are going to initiate a Dux Britanniarum campaign so we will finally see the return of the Chronica Iohannes. Great Game and Great Campaign. Looking forward to entering the dark ages. A fine end to a verry entertaining campaign. I wonder how the idea wouild translate to a French Revolutionary Wars campaign betwen, say, a French Republican and Austrian (HRE) Brigadier? Awesome campaign John. Good on you and Adam for sticking it out to the end. I look forward to following your upcoming Dux shenanigans.